Windows startup sound is very distinctly identifiable but the problem is that it could a reason for everyone’s attention on you.If you forget the mute the speakers Sometimes when you startup your machine and the volume is very high the startup sound can be embarrassing in a meeting, classroom.Here’s a very simple app called Auto Mute that can save you from embarrassment.It can auto mute the speakers once the user initiates a ShutDown or Log Off. 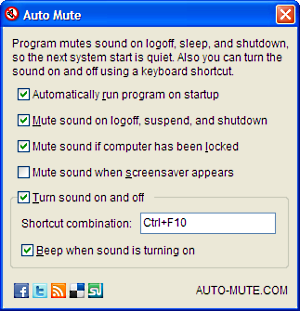 So that the next time you power on your machine, the speakers are by default mute and you don’t have the startup sound to disturb others and save face.Speakers can also be made mute using the keyboard shortcut ( Ctrl + F10 ), which can also be changed from the settings.To open settings right click the “Auto Mute” tray icon or Alt + Click the tray icon. The tray icon has 2 type of icons to show the status of the speakers, the speaker with a tick mark shows that the speakers are unmute and the other icon with a cross-mark shows that the speakers are mute. AutoMute is compatible with Windows and Mac OS.